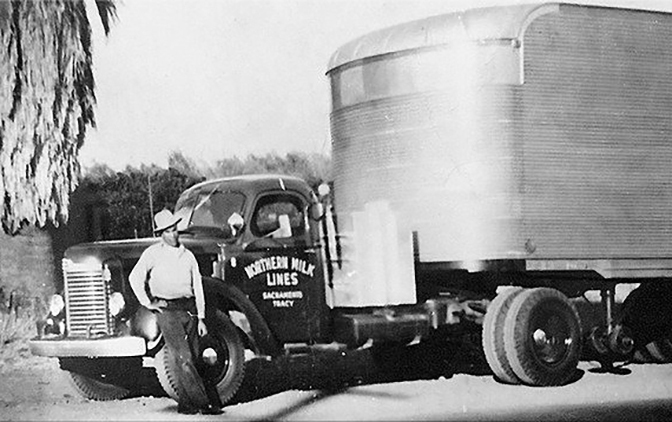 Northern Milk Lines was established in 1947 by Frank & Adeline Mello. The company started off with hauling milk cans and tankers from small dairies to the creameries. In 1962, Frank Mello passed away, leaving his wife Adeline in control of the company. Although Northern Milk Lines had only one customer, the company experienced periods of success. The struggle to survive continued for several years. In 1970, Adeline’s son, Rick, had a solution. He decided that if the company were to continue, they would need to diversify their business into the refrigerated foods market. Their first haul, with a borrowed refrigerated trailer, was from a frozen food company in Modesto, CA. Eventually, the company expanded to include hauling frozen vegetables, poultry and other chilled and frozen foods. During this time, Rick Mello and our future Vice President John Doidge were taking turns working in the office and driving trucks around the clock. Their hard work certainly paid off. In the late 1970’s, the company moved to Ceres, CA and slowly began to expand. A small cooler and cross-dock were added to help with our ability to service the LTL market. The last milk route was eventually sold, and the company re-emerged as Northern Refrigerated Transportation, serving Northern California lanes. By the mid 1970’s Northern expanded its area to service the Southern California market. From the beginning of its transformation, Northern’s ambition was to handle refrigerated LTL traffic and to surpass their competitions’ service levels. From 1980-1995, Northern Refrigerated Transportation expanded into new lanes (NV, OR, WA) and acquired other trucking firms, and added additional Terminals in Fresno and Los Angeles. In 1995, Northern purchased 18 acres in Turlock CA for the future site of its main terminal headquarters. Our corporate terminal in Turlock was completed in 1999. A terminal in Clackamas OR was established in mid 2004.